Here's a fairly detailed guest blog on the influential SLAW site about downloading in Canada. It's by Neil Melliship of Clark, Wilson. Glad to say he agrees with my take from a few days ago. Judge Richard Posner, one of the most prolific, provocative and brilliant judges, legal scholars and public intellectuals of all time (and the only blogger on the bench of whom I know), has come up with a frankly bizarre proposal to save newspapers. 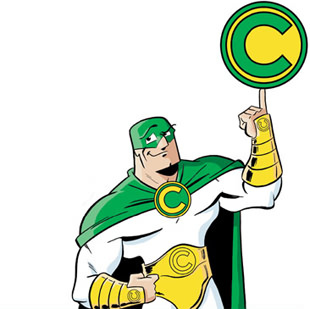 He wants to toughen up copyright law to make linking or paraphrasing without permission illegal. He may not realize that news websites can use embedded robots text code to prevent aggregator sites from linking if they so wish (few do). And to make linking without permission illegal would basically destroy the internet. Linking is what the "world wide web" is all about. Expanding copyright law to bar online access to copyrighted materials without the copyright holder's consent, or to bar linking to or paraphrasing copyrighted materials without the copyright holder's consent, might be necessary to keep free riding on content financed by online newspapers from so impairing the incentive to create costly news-gathering operations that news services like Reuters and the Associated Press would become the only professional, nongovernmental sources of news and opinion. Yes, newspapers are suffering and not just because of the drop in advertising revenue due to the recession. But a drastic change in copyright that would protect facts and prevent linking and would likely do nothing to rescue a lost business model surely isn't the answer. PS: Mark Lemley has pointed me to an earlier article from 2003 by the same Judge Posner called "Misappropriation: A Dirge." The title says it all. It's hard to fit the 2003 piece with the above. If one thinks that it’s excessive for Access Copyright (“AC”) to get $5.16 per K-12 student for a total of about $20 million a year not counting Quebec, get ready for this. For 2010-2012, AC wants to increase this to $15 per K-12 student. There are about 4 million of these “FTEs”. So that’s about $60 million a year. AC will throw in rights to make copies of lost sheet music and choir parts. That’s sweet of them, considering that AC probably has little if any music in its repertoire. It will be really interesting to see what, if anything, the Canadian Music Publishers Association does about this. Turf is at stake, not to mention money. The Copyright Board should not be certifying tariffs for collectives that can't provide repertoire entitlement. Why AC got a free pass in the June 26, 2009 decision on this issue without submitting evidence is not apparent. And as if that’s not enough, AC wants $24 per year for every FTE employee of provincial and territorial governments. I don't know exactly how many such FTEs there are, but there are about 340,000 members of the National Union of Public and General Employees which appears to be the main union. Add in managers and perhaps other unions - and I would guess there are about 500,000 provincial public sector FTE employees in Canada. And I’d surprised if most or all of the photocopying that goes on insider government is for anything other than internal housekeeping (i.e. copying of internal government documents) or “research” purposes, so government can do its job. Like lawyers serving their clients in the Supreme's landmark CCH decision. Let’s see if anyone steps up to plate to defend Canadian taxpayers here. At least $12 million a year at stake here.Not to mention the cascade effect on the federeal government, which has tended to be rather generous to Access Copyright in the past, at least. If corporations and law firms are virually all taking a pass on AC licenses because they can normally charachterize their copying activity as mostly, if not all, being "research" or for internal admin purposes, one would think that governments would have an even stronger case for doing so. Except that some governments - including notably the Federal governemnt - decided early on that it was politically correct to sign expensive licenses with AC, which gave AC crucial funding to get up and running and chase after more markets. Will governments be responsible with taxpayer dollars in the current climate? Here’s the proposed tariff. The deadline to file an objection is July 8, 2009. While both sides will no doubt claim some element of victory, the Copyright Board's decision today in the K-12 reprography matter is bad news for Canadian educators, librarians, students, and taxpayers. The price of knowledge just went up a lot today in Canada. Access Copyright (“AC”) was opposed by the provincial Ministers of Education (other than Quebec) and each of the Ontario School Boards (“the Educators”). It took that Board almost two years to issue a decision that essentially divides the amount sought by AC ($8.92) and the amount proposed by the Educators of $2.43 per FTE more or less down the middle to arrive at $5.16 per FTE. The exact arithmetic average would have been $5.68. Oh yes - there is a lot of detail about fair dealing - with a little bit of water in everybody's wine. The amount per FTE paid for on behalf of K-12 students will more than double to $5.16 from the amount previously paid. With almost 4 million FTEs, and an increase of almost $3 per FTE over the previous negotiated rate, Access Copyright will reap a windfall of about $12 million a year from Canadian taxpayers - not counting those in Quebec. Moreover, the decision eliminates the admittedly dubious “indemnity” scheme operated by Access Copyright for works not in its repertoire. The Board accepted Access's argument, without supporting evidence, that more than 99 per cent of works reproduced by educational institutions are currently part of its repertoire. That seems to be very counter-intuitive, considering the vast number of publishers and authors from around the world who have never heard of Access Copyright and the iffy international payment system for reprographic rights. So - taxpayers in English Canada will pay out $12 million more per year and lose their indemnity scheme, which was about the only sensible thing about the previously negotiated deal from the user viewpoint, even if Access Copyright is not a licensed indemnity/insurance company. The fair dealing analysis is complicated and inconclusive overall - but overall probably a real setback for users. The Board ruled that what the teachers do for the students (“upstream dealing”) isn't fair dealing. On the other hand, criticism by students needn't be communicated to the public to invoke fair dealing. Incidentally, as I've said before on many occasions going back to the early days of this blog in early 2006, the educators in Canada - particularly the K-12 crowd under CMEC - apparently are still largely ignoring the potentially empowering and money saving potential of the CCH decision. CMEC still publishes and endorses and countless educators and school officials in Canada rely upon Copyright Matters! by Wanda Noel and Gerald Breau, which is aimed at teachers and which, as I have noted before, is overly cautious and was obsolete at the time of publication of the second edition in 2005. This is because it does not mention or appear to even take into account the landmark 2004 decision of the Supreme Court of Canada in CCH v. LSUC that opens the door to fair dealing for purposes of research or private study, and says in crystal clear language that copying of an entire work may well be fair dealing. As well, the CMEC publication perpetuates what is essentially an urban myth - that copying anything more than 10% of a work is illegal. It may be that this excessively cautious approach to the CCH decision influenced the approach taken to the survey methodology that the Educators later tried to resile from. In any event, and for whatever reasons, by the time the hearing took place, now almost two years ago, the evidence that the Educators may have needed on fair dealing may not have been available. The Board used its usual complex methodology of crunching numbers to establish values - all of which is difficult to understand and normally impossible to reverse on judicial review. This decision will set a dreadful precedent for higher education. If K-12 students generate $5.16 per year for AC, what will university students be worth? AC will argue that they will be worth several times more. This will result in a huge windfall for AC now and down the line, which is suffering now from the decline of reprography in general. With the internet, reprography is much less important. AC will try to go digital. This could impact well beyond schools and universities to ISPs and others, especially if the educators get their educational exception for the internet and its inevitable “a contrario” implications. The educators enthusiasm for this proposed exception can ultimately only benefit AC. Meanwhile, AC has budgeted an astonishing $915,000 for “Copyright Board applications” for 2009 - when there are no AC hearings scheduled. You can bet that this is going straight into the Mother of all cases aimed at post secondary copying. Will anyone step up to the plate to fight this really hard with a truly adversarial approach aimed at saving the taxpayers tens of millions of dollars? Based upon what we have seen in the past, it's very unlikely. BTW, the real incongruity here is that American schools and universities simply don't face payments of this type. Worse still, these payments and the enormous bureaucracy required to support them also put a big chill on the use of material in the classroom - again, something that doesn't happen in the USA or other countries that are leaving Canada in the dust when it comes to competitiveness and innovation. All of this is something to consider when we revise our Copyright Act and think about Canadian competitiveness and innovation. We have a series of incredibly picky little exceptions for educators and librarians, who have fared poorly in the legislative forum in the past. We need to think outside the box - and look no further than the USA to adopt classroom exceptions and make other changes such as “such as” language in the fair dealing provisions. Otherwise, Canadian taxpayers will get poorer, students will get less educated, and only collectives and their managers and counsel will continue to benefit. Do we really want to pay more for less education? Both sides may have a tricky task in succeeding in judicial review in this instance, because most of what the Board did appears to involve the assessment of evidence. There may be some scope for review on the legal results flowing from that evidence, but it may be hard to extricate the evidence from the legal issues - which would mean that the Board gets more deference. However, given the deep and ultimately taxpayer funded pockets on both sides, a judicial review attempt by one or both sides would not be surprising. PS - there will be a whopping four year retroactive liability here of about $18 million a year starting in 2005-2006. That's about $72 million to date, of which about $40 million is additional to what was already presumably being paid at the old rate, allowing for a token discount of 10% to soften this blow. It'll be really interesting to see what AC does with all of this. Almost two of this four year period involved waiting for the Board to issue its decision after the hearing concluded. In fact, most of the hearing took place in June, 2007 with some follow up delayed unitl October of 2007 due to the illness of a key AC witness. Copyright Reform Back on Course? There's very encouraging news from Michael Geist, who was at Monday's exclusive government digital agenda pow wow. There are strong indications that Ministers Clement and Moore really "get it" when it comes to copyright reform and its relation to innovation, and matters generally digital and cultural. Minister Clement, who has incredibly important responsibilities for everything from competition to communications to copyright, notes that a lot has changed since Bill C-61. And the twittering, young, and very tech savvy Minister Moore once again prominently notes Michael Geist's tweets as a positive example of all that can be done with the various gadgets that he carries in his pockets and uses so often and so well. All of these positive statements and strong hints at what could be a very exciting and constructive consultation process can be seen on Michael's posting today. 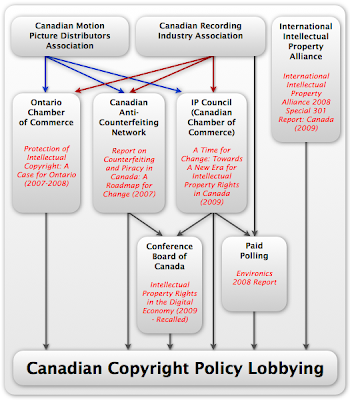 Lobbying organizations such as CRIA and CMPDA, which have clearly spent a fortune trying to hijack the copyright policy agenda in Canada for their members' special purposes and engage in "policy laundering" regarding their own role, may be worried about ministers who actually care about balance, innovation, cool technology and culture - and who are clearly listening to voices other than those of the usual suspects. Could Canada get back on track and show some world leadership here? That would be cool indeed. Clearly, what we are currently seeing in France, the UK, and in the USA is not the way to go. Any smart politician - and both Ministers are clearly very smart - can see that directions such as three strikes, statutory minimum damages against individuals, and digital lock downs are neither good policy nor good politics. This could be an interesting and hopefully very productive summer. Hopefully, we finally have the right Ministers, the right officials, the right politics and the right timing to modernize Canada's copyright law in a constructive, balanced and forward thinking manner - rather than resorting to desperate and artificial attempts to preserve failed and obsolete business models. Michael Geist has a thorough and excellent analysis today of the role of CRIA and CMPDA in copyright "policy laundering", as he calls it, in Canada - including in the recent Conference Board imbroglio. I had raised some questions about these two organizations in this context on June 17, 2009. All of this may even be more incestuous than Michael's chart shows. For example, the USTR gets its "301" information from the International Intellectual Property Association ("IIPA"), a Washington advocacy group that runs out of a couple of Washington law offices and is heavily influenced by the US entertainment industries. As I have mentioned earlier, the reports on Canada are prepared with the considerable input of a well known Washington lawyer named Steve Metalitz. And do you wonder where the IIPA gets its information about Canada? Boyle on Obama Admin Opposition to Rights for the Blind, etc. Jamie Boyle - who was one of the pioneers of the articulate and erudite academic movement in favour of balanced copyright has a good piece in the Financial Times today. It indicates that the Obama administration is opposing rights for the blind due to its deference to the content owners agenda. Why oppose this proposal? Scaremongering aside, there is no real threat to anyone’s business model here. But if one sees any limitation of the most extreme version of copyright as a dangerous and ideologically driven attack on property itself, well then, one must fight. This proposal represents the ideas that rights should have limits and that we should harmonise limitations and exceptions as well as rights themselves. It is that principle, the principle of balance, that must be resisted. Even if it puts one in the embarrassing position of – ever so pragmatically – sacrificing one’s blind citizens to an industry agenda. In a world where we have to deal with torture and climate change and the collapse of our economic system, this little piece of moral cowardice is not something many people are going to notice. But it leaves a nasty taste in the mouth, nonetheless. Save this while you can. These things don't last too long at the FT website. Various tweets from Minnesota confirm that a federal jury as just returned an astonishing verdict of $1,920,000 against Jammie Thomas for downloading 24 songs. That's $80,000 per song. So I post this now - more in sadness than in anger. Whether or not Ms. Thomas is the ideal post-card defendant for this type of case (she clearly isn't, since there were obvious credibility issues), and whether or not she had counsel capable of matching the RIAA team at critical stages, this is not a verdict that should please the RIAA. If a single mother of two kids, age 32, can be whacked for almost $2 million for downloading 24 songs, and the RIAA actually believes that such a verdict should be enforced, can a law that allows this to happen be left on the books for long? It's important to note that, in the USA, bankruptcy does not necessarily discharge a debt involving "willful" infringement. This was clearly such a "willful" case in the eyes of the jury and the amount of $80,000 per work is more than half of the maximum permitted under the statute for such infringement. So - the RIAA has probably achieved more than it wished for here. It has the dubious honour of having achieved a damage award of $1,920,000 for downloading 24 songs - a fraction of what millions of American households have probably downloaded without authorization. Given the civil wrongs caused by drunk drivers, incompetent and/or dishonest doctors and lawyers, polluting corporations, and countless others scenarios, the American justice system should take no pride in this verdict. It could very well come back to haunt those who are now celebrating it. Maybe sooner rather than later in the form of a constitutional challenge to the damage award. PS - here's the Ars Technica story. 250,000 legal and levy free P2P songs for less than CDN $200? Can CRIA seriously say it isn't so? Richard Pfohl of CRIA has taken on Prof. Michael Geist in a letter to the Editor published in The Star on June 12, 2009 in response to Geist's column on file sharing “myths” published June 8, 2009 The Star. Michael Geist fabricates more myths than he dispels, and misinforms Star readers about the legality of unauthorized downloading. Downloading pirated music is not legal in Canada. The copyright law conclusions in the case he cites were overturned on appeal. In fact, the Federal Court of Appeal has subsequently twice ruled that the private copying regime doesn't apply to downloads made to hard drives. Widespread misunderstanding of this legal fact illustrates precisely why digital copyright reform, and the legal clarity it would provide, is needed in Canada. If, indeed, digital audio recorders (or the memories embedded therein) fall outside the scope of the definition, copyright infringement could result from the use of such devices to private copy. So - copying unauthorized sound recordings obtained via P2P onto a 120 GB iPod Classic, for example, where the hard drive memory is permanently embedded (don't even think about trying to take it out!) may indeed be infringing - because the iPod as a whole is a "device" and not a medium subject to the levy. However, a PC internal hard drive that is not “permanently embedded” and particularly an external plug and play hard drive that is clearly not in any sense “embedded” in anything and serves no function other than to be a large memory medium may very well be “audio recording media.” In that case, downloading any sound recording onto them obtained in any way from any source for private use would be legal in Canada, regardless of whether a levy has ever been sought from the Copyright Board. This follows from what the Copyright Board said in 2003 at page 20-21 of this famous decision and, contrary to Mr. Pfohl's assertion, no Canadian Court has ever ruled to the contrary. A levy-free terabyte external hard drive that now sells for less than CDN $200 can hold about 250,000 songs downloaded via P2P. The fact that this is apparently legal in Canada is the direct consequence of the private copying levy scheme that Mr. Pfohl’s employer, the Canadian Recording Media Association (“CRIA”), so enthusiastically and effectively lobbied for and was given in the 1997 amendments to the Copyright Act. CRIA was short sighted. Mass access to the internet was already in full flight and the concept of the “celestial juke box” was already old news at that time. The Canadian levy scheme has now generated more than a quarter billion dollars. CRIA members whine about the consequences of their legislation all the way to the bank (and indeed incessantly afterwords), but keep on cashing the cheques. As CRIA must constantly be reminded, “be careful what you wish for.” And hopefully, Government officials, MPs and Ministers will be careful about who they listens to when it comes to Canadian copyright law and sound public policy. CRIA and some of those who speak for it it, have a poor record for foresight, wisdom, credibility and even basic accuracy in these matters. All of that said, it is by no means clear that well conceived litigation against individual file-sharers (in contrast to mere downloaders) backed up with sufficient, reliable, non-hearsay and convincing evidence would necessarily fail in Canada under current law under some scenarios. CRIA's members were given a green light or at least an orange light to proceed on such a basis by the Federal Court of Appeal in 2005, but have been unable or unwilling to bring forward the necessary evidence to even try. Perhaps they prefer instead to propagate the myth that current Canadian laws are inadequate, to play the role of the victim of mass "piracy", and to demand new, unnecessary and overreaching legislation. One would have thought that the recent Conference Board of Canada fiasco would have resulted in lessons being learned by copyright lobbyist organizations. Apparently, in CRIA's case, that’s not the case. Excellent column by Michael Geist in the Ottawa Cit. today. Nice to read policy ideas & substance - not just horse race politics & gossip. BTW, I should disclose that I've been involved as counsel in all of the above cases about which Mr. Pfohl is inaccurately opining. The Conference Board has taken the next step in damage control arising from its recent plagiarism scandal. Here's today's statement. The evidence indicates there was undue reliance on feedback from a funder who was deemed to have important technical expertise. The report in question was to have been rolled out as a key item at a Conference Board conference on May 29, 2009. Here is the program, which shows a list of sponsors and the Advisory Board of that rather imbalanced and expensive event, which, in fairness, covered quite a lot of material other than copyright. Nonetheless, and despite the breadth of the conference, two of the four members of the “Advisory Board” for the conference were the heads of CRIA and CMPDA. These have been two of the most, if not the most, energetic, persistent and successful (in terms of legislative influence) copyright lobbyist organizations in Canada since the 1980's. It's a fair question to ask whether either or both these two well known and well funded organizations (which represent mainly American interests) were among the funders or were otherwise involved in the specific ill-fated research project now in issue. BTW, here's what it costs to “sponsor” a Conference Board conference. When completed, this work will be presented to a multi-stakeholder Roundtable to be held in the fall. We will publish a summary of the Roundtable discussion, reflecting the full spectrum of views on the issue, as an Appendix to the research. One can only wish Dr. Corbin and the Board luck in sorting all of this out. The scandal may not reside only in the fact that much of the key content of the now withdrawn work was plagiarized but that much of the IIPA material that was apparently recycled as “research” may have been utterly unreliable to begin with. I'm not sure that it's possible to “redo” that kind of work. PS & Update - the Conference Board did acknowledge the financial support of several coalition or umbrella groups in this case. But that still leaves questions unanswered - namely who was really actively involved in the sponsored research. See comments below. PS and update #2 - more connecting of dots and about the courageous Curtis Cook, former employee of the Confernce Board, in a Canwest story here. Lord Carter's Digital Britain report can be found here. The Scotch Whisky Association's attempt to get leave to appeal the very sensible decision of the Federal Court of Appeal has - as I predicted - been scotched by the Supreme Court of Canada this morning. (Coram: McLachlin / Abella / Rothstein ). As usual, with costs and without reasons. Now, Glenora Distillers in Nova Scotia can have its trade-mark registration of GLEN BRETON for "single malt whisky." The whisky is made in Canada and has never been called "Scotch" whisky by its manufacturer, althougn Justice Sexton of the Federal Court of Appeal did note that "I believe it is fair to say that Glenora has marketed its product as being like a single-malt Scotch in everything but name." The word “glen,” being a common word and forming part of numerous registered trademarks, is at best a weakly distinctive component of those trademarks. However, by segmenting those trademarks to consider “glen” as a mark on its own, this court would be affording stronger trade protection to that word than is due. In short, success in this appeal would jeopardize the trademarks of many of the Association’s members. In my view, this cannot be the correct result, and is not true to the spirit and purpose of section 10 of the Act. Accordingly, I would allow the appeal, and direct the Registrar to allow Glenora’s application for the registration of GLEN BRETON. 10. Where any mark has by ordinary and bona fide commercial usage become recognized in Canada as designating the kind, quality, quantity, destination, value, place of origin or date of production of any wares or services, no person shall adopt it as a trade-mark in association with such wares or services or others of the same general class or use it in a way likely to mislead, nor shall any person so adopt or so use any mark so nearly resembling that mark as to be likely to be mistaken therefor. AFP - France's highest legal authority on Wednesday struck down a key provision of a contested Internet piracy law that set up a new state agency to cut off offenders from the web. Here's the breaking story from AFP. And from Cory Doctorow at Boing Boing. I will be participating today Tuesday June 9 at 3:15 EST in a day long session of online interactive presentations on Copyright Wars hosted by an exciting new enterprise called Brighttalk.com. I would encourage you check out the other presentations and tune in free - you can see them listed here. Note that Ray Beckerman will be talking about the the RIAA mass litigation campaign at 5:45. I'll be dealing with ACTA, WIPO and Canada. You'll be able to send in questions in real time...this is interactive. In a kinder and gentler time, before the era when big pharma v. generic Notice of Compliance litigation has almost taken over the Federal Court, Canada used to have lots of litigation about beer and spirits. Indeed, much of Canadian trade-marks law owes its existence to those more mellow days. Where any mark has by ordinary and bona fide commercial usage become recognized in Canada as designating the kind, quality, quantity, destination, value, place of origin or date of production of any wares or services, no person shall adopt it as a trade-mark in association with such wares or services or others of the same general class or use it in a way likely to mislead, nor shall any person so adopt or so use any mark so nearly resembling that mark as to be likely to be mistaken therefor. The SWA succeeded before Justice Harrington in the Federal Court, but this decision was reversed on appeal - and quite properly so in my view. S. 10 simply doesn't apply in this situation. 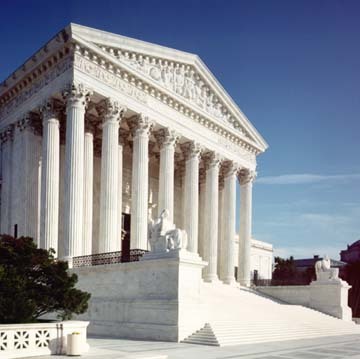 Justice Sexton of the Federal Court of Appeal correctly noted that many of the SWA members’ trade-marks containing GLEN would be in jeopardy if SWA’s argument on s. 10 had actually prevailed. It is therefore somewhat surprising that the SWA has now sought leave to appeal the FCA decision to the SCC. It will be, frankly, even more surprising if they get leave. Had the FCA gone the other way, it might well have been an issue of “public importance” because Canadian trade-marks law would have become quite unpredictable. However, the FCA reached the conclusion that most IP lawyers would have predicted and the law on s. 10 seems just fine as it stands now and always did. Now, for those whose interests run more to suds than single malt whisky - from wherever it may hail - consider that Labatt is suing Brick Brewing over the Red Baron label on the left, which Labatt alleges is confusing with it label on the right. Interestingly, Brick has a registration in a very similar - though not identical - label to the one on the left that predates Labatt's registration on April 29, 2009 in the label on the right by about 18 years. Yet more interesting is that Labatt is suing for copyright infringement. Even more interesting is that Labatt is seeking interim and interlocutory injunctive relief - which is almost never granted in the Federal Court these days. I'd say that Labatt has an uphill battle here. I will be participating on Tuesday June 9 at 3:15 EST in a day long session of online interactive presentations on Copyright Wars hosted by an exciting new enterprise called Brighttalk.com. I would encourage you check out the other presentations and tune in free - you can see them listed here. British "compromise" v. French "Three Strikes"
The British Government - or what's left of it and if it survives - is considering a requirement that ISPs impose presumably significant bandwidth speed limits on alleged repeat infringers. What will be infringing and how this will work is unknown. Here's the BBC report. I'm reluctant to disagree with the IP-Kat because its such a good blog and Tufty looks so judicious but I don't consider this a reasonable "compromise", presumably between the options of status quo and the French three strikes regime. I note that the IP-Kat qualified its endorsement in a potentially significant way - i.e. " If the technical solution works, it could be a nice compromise." (emphasis added). This approach makes about as much sense as imposing a severe speed governor on the family car because one the household teenagers gets a speeding ticket - or even three speeding tickets. Or three of the household teenagers or their friends each get a speeding ticket. In this case, its even worse because the record industry will be presumably be the traffic cop, the prosecutor, and the judge. And they will use a very invasive and unreliable form of photo radar. Severely crippled internet access is a severe penalty - especially when it could be imposed on an entire family - and imposed by mistake. MEA CULPA - earlier I today I said that there was a very short deadline until July 1, 2009 for this competition. I thought it was announced only today because I received a blast email from IPIC today. While the email and links seemed new, the subject of the email did indicate that it was a "reminder." My fault. In fact, it was apparently announced April 6, 2009 here. Which still didn't leave a lot of time for the July 1, 2009 deadline , considering the end of term, exams, etc. But much more than the three weeks I earlier wrongly indicated. So - consider this blog today as a "reminder" too. Here's the full information about the IP Writing Challenge. The idea of this is a good one. There have been IP writing competitions in the past, and hopefully lessons have learned to ensure that there will be complete fairness and balance in the adjudication process, which has frankly not always been the case. There is a mechanism in place here to ensure “blind” judging in terms of the identity of the contestants. However, it will be interesting to see whether a submission that may be otherwise worthy but is considered too “copyleft”, for example, can survive whatever process and panel may be in place. All entries will be reviewed by a panel of judges selected by the Challenge Sponsors. The Challenge Sponsors reserve the right to not declare a winner in any or all of the challenge categories at their sole discretion. Hopefully, the panel of judges themselves will reflect true balance and will be looking not only for work of high quality but work that truly reflects the concept of “Challenge”. Let's hope that lots of students and young lawyers found out about this in time and that we get some really good papers out of it. 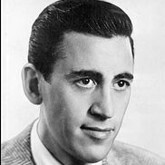 J. D. Salinger, now 90 years old, sues - again. The remarkably reclusive, litigious and non-prolific (as far we know from publications) writer has sued over the expected publication in the USA of an "unauthorized sequel" called 60 Years Later: Coming Through the Rye, written by someone who the WSJ calls "a purported American living in Sweden named John David California." There's a brief discussion of the background here on the WSJ Blog, along with a good discussion and interview with a NYC copyright lawyer about sequels, parodies, and the possibility of copyright in a character. Salinger and Jean Sibelius are examples of creators who enjoyed great success at a relatively early age and became unable or unwilling to follow up to any extent to satisfy the public's appetite for their creativity. That's no reason to shorten the term of copyright - but these are important and prominent examples of why longer terms and stronger rights do not necessarily provide an incentive to create - and in the case of some individuals with substantial incomes from early success may paradoxically provide precisely the exact opposite by, in effect, enabling very early and comfortable retirement. BTW, the works of Sibelius (1865-1957) will be protected in the EU until the end of 2027. In the USA, some of his work may be protected that long if properly renewed, although anything published before 1923 in the USA would not be. He wrote no major works after his Symphony No. 7 in C major for orchestra, Op. 105 (1924). Not that it's relevant, but his work was stylistically anchored to the 19th century and essentially immune to 20th century influence. His work entered the public domain in Canada on January 1, 2008, along with others as chronicled yearly by Maestro McLean of the Public Domain. Speaking of the US Supreme Court, Charlie Nesson - the Harvard professor who is leading the ultra-controversial defense of Joel Tenenbaum - has sought certiorari (i..e. "leave to appeal" in Canadian) from the US Supreme Court on the First Circuit's rebuff of his attempt to have the proceedings webcast. Oh yes, and a stay in the meantime. Which if granted could be a long time. The trial is currently set for July 20, 2009.
with the current needs of our citizenry and our nation. in any event, the District Court agrees to stay this case for what could be a very long time. Documents available here and hat tip as usual to Ray Beckerman. PS: June 2, 2009. No surprise. District Court Judge Gertner denied the motion for a stay. HT Ray Beckerman. Here are the background documents. This case involved a patent for a method of hedging in commodities trading developed by Bernard Bilski and Rand Warsaw. Here's a quick take from the WSJ. For the more determined, go to Patently-O.